With contributions by Étienne Balibar, Claudia d'Amico, Nikita Dhawan, L'ubomír Dunaj, Mathieu Hauchecorne, Axel Honneth, Christoph Kann, Stefania Maffeis, Thorsten Paprotny and Vladislav Suvák. Étienne Balibar: Fremde, nicht Feinde. In Richtung eines neuen Kosmopolitismus? The article reflects on the present confusion between the category of enemy and that of stranger as result of a process of multiplication and reinforcement of territorial borders along ethnic and racial criteria. In particular, the text considers the external and internal borders of Europe as complex dispositivs of territorial control, which produce specific forms of foreigners as strangers and as cultural enemies. In order to analyze and stop this process, a cosmopolitan rethinking of the idea of citizenship is at stake here. Transnational citizenship will be discussed in the frame of a philological model of translation between cultures and opposed to the model of an absolute untranslatability that characterizes the global civil wars. Cosmopolitics is thus conceived as a practical universalism, a progressive overcoming of the idea of the stranger in view of an idea of co-citizenship. Transnational co-citizenship does not suppress national identities but puts them in relation to all other sorts of particular identities and interests in order to create a contingent, maybe precarious but always concrete world of commons and communality. One of the most pervasive repercussions of the claim that Enlightenment was always already anti-imperial is that postcolonial critique is rendered redundant and the project of decolonizing European philosophy becomes unnecessary. Contesting the exoneration of Enlightenment philosophers of racism and sexism, this article debunks the claim that Kantian cosmopolitanism was an antidote to colonialism. Addressing the ambivalent legacies of European Enlightenment for the postcolonial world with special focus on the current ›refugee crisis‹, the article examines the enduring normative violence exerted by Enlightenment principles of cosmopolitanism. Drawing on Gayatri Spivak’s ideas of transnational literacy and planetary ethics, the article underscores the contribution of postcolonial-feminist critique in imagining post-imperial philosophy in a global age. 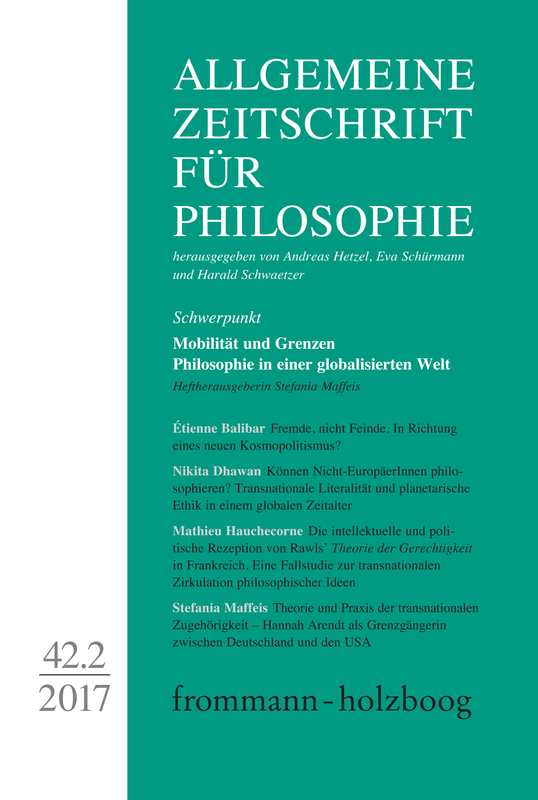 This article investigates the mechanisms underlying the transnational circulation of philosophical ideas through a particular case study: the reception of John Rawls and US theories of justice in the French intellectual and political fields. It traces the different sequences of this reception process, from an initial reception within political arenas to the academic recognition of Rawls. The article stresses how the appropriations of Rawls in the French context are embedded within the controversies which have characterized French politics and intellectual life during the last decades. The last part of the article analyses how, for a significant part of Rawls’ French mediators, the interest for his philosophy articulates with their intellectual and religious trajectories. Together with the experience of time, finiteness and death, age(ing) is among the crucial, though neglected, topoi of existentialism. Its early representative Kierkegaard already emphasized the fundamental role of ageing as a basic condition of human existence which finds orientation in projections of the future. Similarly, Camus, who presupposes that human beings are afflicted with the experience of absurdity, incorporates the ambivalent phenomenon of ageing in his anthropological reflections. Latently following stoic ideas and with recourse to aesthetical considerations of nature, Camus develops an autobiographically imbued philosophy of ageing that dwells on the immanent conditio humana and clearly refrains from speculative transcendental assumptions. He inspires us to a critical analysis of established stereotypes of age(ing) beyond the options of striking demotion and uncritical euphemization of later periods of life. Thorsten Paprotny: Gerd-Günther Grau (1921-2016).